VANCOUVER – On Thursday, Clark College President Robert Knight gave the annual State of the College address to an assembly in Gaiser Student Center at Clark College. The address focused on areas of growth over the past year, expectations for the coming year and recognition for staff and faculty that have made an impact on the college over the past year. Attendees were first welcomed to the address by Grace Moe, president of the Associated Students of Clark College. Music major Rachel Smith performed the national anthem, before Knight took the stage and began the address. Knight began by first recognizing various government officials, civic leaders and business leaders in the audience that have contributed to Clark College in the past. Knight also took the opportunity to remember the life of Gianna Loville, a freshman member of Clark’s women’s basketball team who passed away suddenly on Jan. 12. 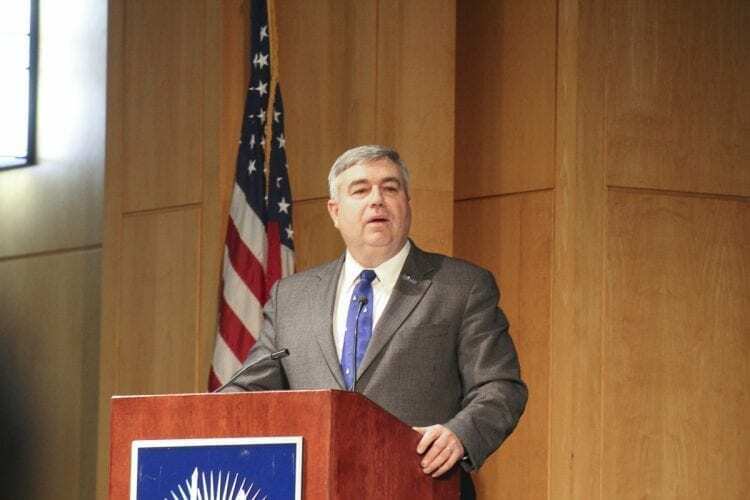 The State of the College address provided an opportunity for Knight to reflect on the past year’s accomplishments as well as look ahead to the coming year. Knight began by highlighting some of the successes the college achieved in 2017. 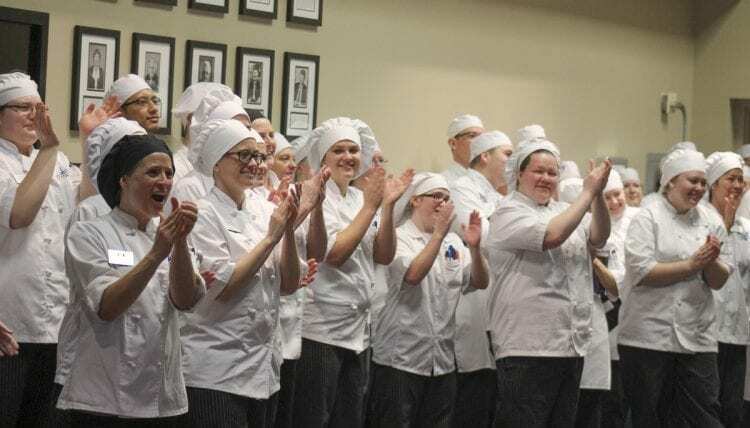 Last November, the college reopened its culinary institute after several years of hiatus. The opening of the Tod and Maxine McClaskey Culinary Institute was the “realization of many years of effort,” Knight said. It will allow students to achieve their goals in a field that Clark has not been able to serve for several years, Knight said. He noted triumphantly that some people believed the culinary institute had been shut down permanently, but that the college was able to reopen it for its first cohort in the fall. Students in the program attended the address, and Knight introduced the first class of the new culinary institute to the public. Knight then discussed the college’s model of “guided pathways,” which is entering its second year as a school policy. The policy is designed to help students navigate the college process, with the end goal of increasing student success. Knight said that the guided pathways policy helps provide structure and conditions and a “personal connection” to students to help them graduate. The goal of the policy, Knight said, is to have all students, regardless of ethnicity or socio-economic status, “achieve and succeed at the same rate.” Doing so supports the college’s plan for social equity, Knight explained. Success of the policy has brought national recognition, Knight said, as well as national support to allow faculty and staff to continue to help foster student achievement. Last November, George Fullerton, a “long-time Clark College coach and supporter,” established an endowment to provide scholarships for student athletes. The endowment will provide 20 scholarships annually going forward. In addition to the opening of the Tod and Maxine McClaskey Culinary Institute last fall, Knight noted that Clark College also introduced a Bachelor of Applied Science in Applied Management. The program is currently full, Knight said, and the school wants to add more cohorts in the future. Internationally, Knight said that Clark College recently signed three agreements with colleges and universities in Japan in an effort to strengthen the college’s ties to that country. One of these agreements was with Kyoto Women’s University, which agreed to allow Clark College Japanese language students the opportunity to attend the university for 3 weeks for only $600. Rounding out the achievements of last year, Knight said that representatives of the college worked hard to place funding for construction on Clark College at Boschma Farms on the state capital budget. “Clark College really is a catalyst for the possible,” Knight said. Looking forward to the coming year, Knight outlined some of the challenges facing the school. While calling it a success to place the Boschma Farms funding on the state capital budget, Knight noted that the budget did not pass. State lawmakers “did not do their job,” Knight said, and because the budget did not pass, work on the project did not proceed. He urged the audience to urge the legislature to pass the capital budget, as it would help Clark College proceed with future plans. Knight said that Clark College values diversity and social justice. He said that a goal for 2018 is to remain committed as a school to being an open and welcoming college environment for people of all backgrounds, and reemphasized the college’s commitment to its DACA students. In Clark County, Knight said that there is a gap between an increased number of available jobs and a decrease in workers. Clark College is currently seeing a decline in enrollment that Knight said is expected to continue. Despite these factors, Knight said that the college must focus on retaining current students and ensuring the students enrolled complete their education. To help address a shortage of workers, Knight said that Clark College will strive to make its students aware of job opportunities and ensure they are getting the proper training and instruction to fill those jobs. Looking to the future, Knight said that the guided pathways program will help students succeed. “All students deserve a chance to succeed in their lives,” Knight said. Under the policy, obstacles to success at the college are removed. Guided pathways also help foster student success by helping staff and faculty connect with students. Knight gave several examples of staff that have been successfully connecting with students and fostering learning. Keith Stansbury, a computer aided drafting and design professor, builds rockets and drones with students after class, and takes students to national competitions where they compete against schools like MIT and University of California, Berkeley. Kathleen Perillo, a biology professor, and Erin Harwood, a science, tech, engineering and math instructor, have helped students gain practical experience in the field by using the 70-acre Clark College property in Ridgefield as a laboratory. Knight said that they have worked with students to find ways to turn a dried up creek back into a living stream in the future. Further honoring staff for student success, Knight gave out three presidential coins to individuals who have contributed to student success on campus. Rachele Bakic, associate dean of instructional operations, Armetta Burney, director of workforce education services, and former senator Al Bauer all received the presidential coins.